This guided tour meets at 10.45 am daily throughout the year. We are comparing Grandeur of Venice Skip Line to Doge's Palace and St. Mark's Basilica Tour Prices from leading ticket suppliers and Try to find you Cheap tickets prices on the market. Take a look at any guidebook, new or old, St Mark's Basilica and Doge's Palace are certain to be listed among the city's ‘must see's'. Both have played important roles in the history of Venice, in the development of the city and expansion of the Venetian Empire. On this guided tour you will get to visit both locations and hear about the history, stories and legends surrounding them. You can forget about queuing for hours because this ticket gives you Skip the Line priority entrance to both attractions. Once inside the Doge's Palace you'll walk through majestic halls with fine wood furniture and elegant chandeliers. Imagine the Duke and his council sitting to discuss the city's political matters. But it's not all about grandeur on this tour, you'll also see the damp dungeon in which Giacomo Casanova was detained and cross the bridge of sighs, where prisoners would glance down to Venice's pea green canals for the last time. Next you'll breeze past the line and into St Mark's Basilica, walk beneath beautiful mosaics, rich golden tiles and precious gems. Your guide can take you through Byzantine artwork, mixed with Roman and Venetian influences and lead you to priceless artifacts in the Pala D'Oro. This tour will suit people with a limited amount of time in the city because you will go straight to the entrance without queueing. Suitable for adults, children and seniors. Your Experience With Grandeur of Venice Skip Line to Doge's Palace and St. Mark's Basilica Tour? Enjoy convenient fast-track entry to 2 of Venice's most popular attractions, Doge's Palace and St Mark's Basilica. Discover the original house of Venetian Politics with the aid of a knowledgeable and multilingual guide. Take a guided tour of St Mark's Basilica, one of the grandest Cathedrals ever to be built in Europe. 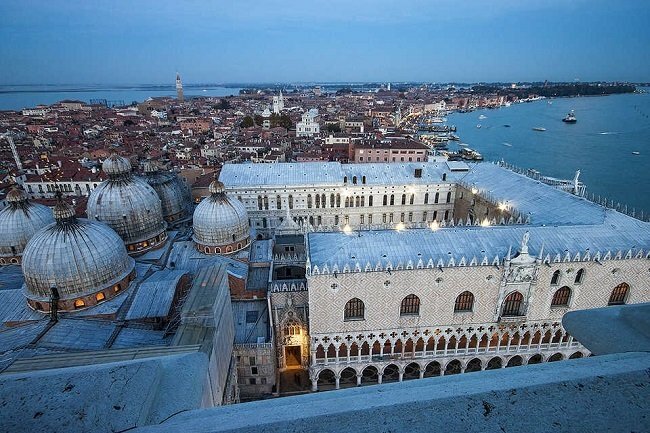 What Grandeur of Venice Skip Line to Doge's Palace and St. Mark's Basilica Tour Includes? Guided tour of St Mark's Basilica and Doge's Palace in English, Italian, Spanish, French or German. Skip the Line entrance ticket to St Mark's Basilica and Doge's Palace. Headphones for larger groups (to clearly hear your guide). If English is not your first language then don't worry because the tour is available in multiple languages, check with your supplier for tour times. Travelers Reviews about Grandeur of Venice Skip Line to Doge's Palace and St. Mark's Basilica Tour? The Grandeurs of Venice Tour has 4.5-star reviews on Get Your Guide and Trip Advisor. Meanwhile the tour has and average 5 out of 5-star score on Viator. Mainly customer reviews say that the tour is very informative and that the guides defiantly know their history. Traveller reviews imply that the tour is good value for money. Tickets may be refundable up to 24 hours before departure, however, some providers require 3 or 7 days notice. Knees and shoulders must be covered to enter St Mark's Basilica. Comfortable shoes (no high heels) are recommended. Tours may be cancelled in the event of flooding (Acqua Alta). Meeting Point: Under the Clock Tower, Piazza San Marco.